Well, we recently finished the first round of Hollywood's self-congratulations season, with the Screen Actors Guild (S.A.G.) Awards, The Golden Globes, and the People's Choice Awards. There are still a few more to come, including the Academy Awards and the Emmy's, but personally, I'm not a big fan of these awards or the several hour shows that occupy major network coverage. Luckily, there's cable, so I didn't have to sit through a whole evening watching awards for movies I didn't even see! After all, aren't the bloated paychecks and adoration of millions of fans sufficient for these people? Perhaps not. Established by Eli Lilly and Company in 2002, the LillyforLife Achievement Awards is a recognition program that celebrates the inspiring achievements of people of all ages who live with diabetes or who contribute to the lives of those with diabetes. Those recognized do not have to be well known or famous for their achievements, but can be everyday people who have accomplished or are working toward exceptional personal or professional success. For each winner selected, a $1,500 cash prize will be awarded. Additionally, each winner and a guest will be hosted at Lilly Headquarters in Indianapolis for a tour and VIP celebration, and will also receive an etched trophy. The deadline for applications is July 31, 2007. Winners will be notified no later than August 31, 2007. 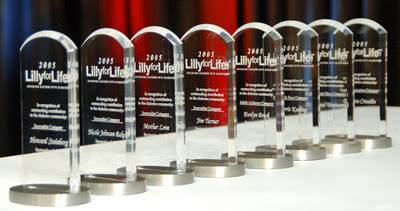 Award recipients will be announced publicly in August and posted on www.LillyforLife.com soon thereafter. As a world leader in diabetes care, Novo Nordisk is committed to increasing the level of awareness of diabetes. The media have a critically important role in informing the public about the disease. Therefore Novo Nordisk founded the Novo Nordisk Media Prize for excellence in writing on diabetes in the lay press in 2002. The award is given to the best written article on diabetes in general and is evaluated by a totally independent international jury. The article and TV feature must be about diabetes (treatment, products, health issues and so on), be published or broadcast in lay press, and communicate about diabetes in an interesting, appealing and factually correct way. Each winning contribution in the international contest receives a cash prize of 10,000 euros. I'm not sure about when the Novo Nordisk Media Prize Awards are selected, but its not too soon to think about who you'd like to nominate. Typically, the awards are announced by the company towards the end of the year. Perhaps in the future, these awards will receive online media coverage, like on YouTube? Let's make the 2007 awards much bigger and much more competitive! !